ICM’s post merger integration process will help you shorten the integration cycle and accelerate your ability to generate value from your mergers and acquisitions. We adapt the overall range of our offer to the specific situation and context of our client. The following overview will give you an idea of the support ICM can offer. This period, sometimes quite drawn out due to legal or contextual reasons, is a difficult period for the teams involved. How do we manage to communicate when there’s no information to communicate about? How do we prepare the first interactions? How do we manage the stress levels in this period of uncertainty? How do we anticipate the “cultural shocks” that we might have to face after the acquisition. 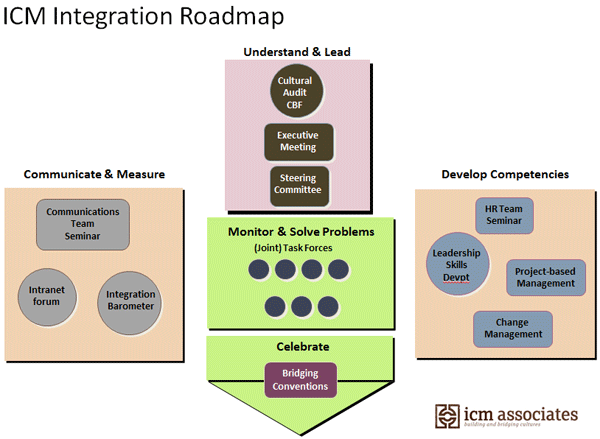 Once the closing is completed, it’s time to drive and lead the integration process. Questions at this moment include: How do we design and manage this common project? What processes do we put in place to lead the integration? How do we who will take which role? How do we develop new processes? How do we “sell” the project internally in order to mobilize energy and enthusiasm? What specific roles do we define for communication and HR in this process? Steering committee: ICM will work with the integration steering committee to define the first phases of the integration process with respect to cultural integration, communications, problem-solving task forces and feedback to the executive committee. Cultural diagnostic: this audit, based on ICM’s diagnostic tool – CBF© Cultural Bridging Fundamentals©, identifies the key cultural elements of both companies, including an analysis of their expectations and fears regarding the integration. It also provides insights into whether key performance drivers and motivation factors are shared or not. Integration seminars with leadership teams: based on the cultural diagnostic, these seminars enable work on mutual perceptions and understanding. On this basis of greater understanding, they lead teams to identify the business priorities that need to be resolved and allow for planning on how that will be done. Focus on business issues and support multifunctional task-forces and task-force leaders in processes and working methods that will accelerate problem-solving on business issues. – Intranet Forum: create an Internet Web site on the integration program that allows people to get to know one another, facilitates information-sharing and provides a forum for FAQ’s and on-going updates on successes and quick wins. – Integration barometer: to monitor progress on the integration process and the degree to which real behavioral changes are taking place.